Receding gums are characterized by the gum tissue margin surrounding the teeth wearing away. This results in more of the tooth surface being exposed, and in some cases, the root becomes exposed which can cause pain and intense sensitivity. Gum recession is often an initial sign of gum disease, a condition that can get very serious, cause tooth loss and affect overall health. This is a very common problem and many people are unaware that their gums are receding until they have receded to a noticeable level. Gum recession can be treated so that further damage is prevented. 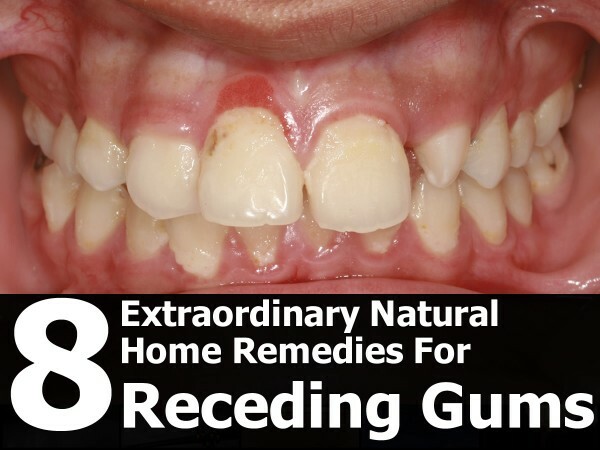 There are natural home remedies for receding gums that can help to stop the problem and promote better overall gum health. Green tea is packed with antioxidants and it helps in the prevention of a multitude of diseases. The damage caused by receding gums may be decreased with the regular consumption of green tea. It works by reducing gum inflammation and it aids in the destruction of bacteria in the oral cavity which works to prevent periodontal disease. Just one cup each morning can provide gum-healthy benefits. Sesame oil helps to reduce plaque buildup and it removes toxic substances from the oral cavity. Plaque buildup and toxins can contribute to receding gums. You need a quarter of a cup of this oil and then use it as a mouthwash, swishing it around in your mouth for about 30 seconds before brushing your teeth. You can still use your regular mouthwash and pre-brush rinse too. To improve plaque and toxin removal and to encourage better absorption, the oil can be slightly warmed, but never hot. Warmed sesame oil also helps to prevent dental decay and gum recession because it provides a protective coating on the gums. Coconut oil is antimicrobial in nature making it an excellent choice to reduce gum recession and help to treat the various things that can cause it, such as bacteria-related gum diseases. In addition to helping to reduce pre-existing bacteria, this oil and can help to prevent the overgrowth of new bacteria and germs. It works to prevent tooth decay and further gum issues by ridding the teeth and gums of germs and food particles. This oil can be used on a daily basis for general oral hygiene and to prevent receding gums. Make sure to use a virgin oil and then use it like a regular mouthwash by swishing it around in the mouth for 30 seconds after brushing. If you use regular mouthwash too, use this afterward so that the protective benefits are not washed away. Aloe vera is very healing and its antibacterial and anti-inflammatory benefits extend to helping to protect the gums and teeth from receding gums and decay. Infections and damaged gums can also be healed with aloe. Take a fresh piece of aloe and use the gel within it to brush the teeth. This can be done after regular brushing, flossing and use of mouthwash. Lemon oil works well as an antibacterial agent and it also possesses mild antiseptic properties. Lemon is powerful in preventing tooth decay and gum recession due to its ability to destroy bacteria in the mouth. However, unlike most other remedies for receding gums, you cannot use this on a daily basis because it is acidic and can wear away the enamel if used too frequently. It is best to use this about once a week and make a mixture of an ounce of extra virgin olive oil and the juice from about one-fourth of a fresh lemon. This makes enough to do two swishes in a day, once in the morning and once in the afternoon, preferably after lunch. Just swish this around the mouth like you would a regular mouthwash to get the full benefits. Eucalyptus is an essential oil that prevents gum disease and tooth decay, and it kills germs to prevent the diseases that cause gum recession. This oil also works to reduce gum swelling due to its anti-inflammatory properties. This oil has to be diluted with water because straight eucalyptus oil should not be applied to tissues like the gums. Take a little bit of the mixture on a clean finger or on a soft-bristled toothbrush and massage the gums with it for a few minutes. This helps to reduce gum recession and it stimulates new tissue growth. This biblical resin comes from trees and it is well-known for its ability to stop gum recession, prevent damage to the gums and teeth and prevent root exposure. This resin also has distinct abilities to strengthen the gums which reduces the risk of gum recession and gum disease. This can be made into a paste or it can be used as rinse, depending on your personal preference. Cloves have been used for thousands of years as a remedy to reduce issues associated with oral infections and with damaged or decaying teeth. Clove oil is a powerful antimicrobial, antiseptic and anti-fungal agent that helps to cleanse the oral cavity and stimulate the repair and growth of any tissues that have been damaged, including receding gums. When used frequently, clove oil helps to stop bacterial action and disinfect the mouth. Apply clove oil to a clean finger or a soft-bristled toothbrush and massage this into the gums once a day. One thing missing here is the Neem powder. It actually heals teeth, sterilizes mouth and even stops sore throat. I was able to delay expensive root canal work about two years now. Tooth stopped hurting. I used to buy it but my wife brought some leafs from Philippines and I made my own powder. It works great.